NES A Week of Garfield (JPN) in 08:02.81 by goofydylan8. 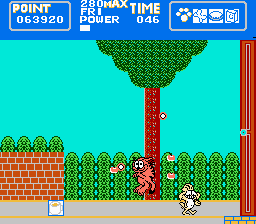 A Week of Garfield is a 1989 Famicom exclusive based on the comic strip character Garfield. In the game you play through levels which take place on each day of the week on your search to find Odie. This game is surprisingly hard. Playing the game without dying (which results in a game over since you only have one life), let alone not losing any health, is extremely challenging. At times the screen is nearly filled with enemies and requires frame specific movement to avoid taking damage. But don't worry, goofydylan8 manages to make this game look like a piece of cake and beat the console world record by 4 minutes.